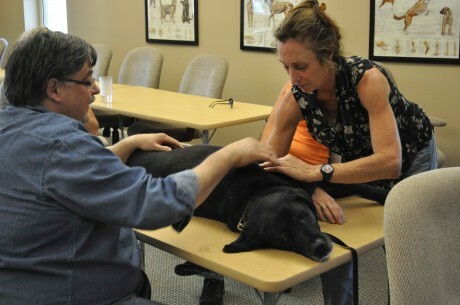 How often your dog or horse needs a chiropractor is dependent on the age, past health issues and activity level. Chiropractic adjustments when there is pain is more frequent, usually 1 per week. Once the pain and issues have resolved your animal has the opportunity to really see the benefits of wellness chiropractic care.Wellness care is not treating lameness or pain issues but rather improving and be proactive in preventing future issues such as degenerative arthritis and a myriad of health and performance problems. If your horse or dog is involved in showing from dressage, eventing, jumping, hunting, agility, obediance, dock diving, flyball, and conformation then it is imperative that a program of wellness chiropractic care is utilized. By keeping the joints freely moveable you will prevent nerve irritation, muscle soreness, loss of motion, and even many organ dysfunctions since all muscle input to the nervous system effects organ function at the level of the spinal cord. The usual wellness plan will be approx once per month to every 6 weeks. During heavy show season sometimes it may be once every 2 to 3 weeks. If your horse or dog is not showing then wellness care for general health promotion is also important since many problems arise from improper joint motion that is not symptomatic until the injury occurs, such as Cruciate Ligament problems, Arthritis, and Disc problems to just name a few.